Automotive fuel cell market size was estimated at over 5,000 units in 2015, and is expected to grow at a CAGR of 12.7% from 2016 to 2023. Growing consciousness regarding harmful emissions from gasoline and conventional fuel vehicles is expected to drive the industry over the forecast period. Fuel cells help in eliminating noise pollution as they are quiet in operation. In addition, they also offer high reliability and safety as there is no combustion activity involved during the energy production. These products have longer life as it is not subjected to high operating temperatures and minimal corrosion probability owing to absence of combustion process. Less exposure to high temperatures and absence of corrosion in these devices helps in cutting down maintenance costs. This in turn is predicted to act as catalyst in for automotive fuel cell market demand from 2016 to 2023. Surging research and development activities are likely to create high employment scope as well as business opportunities for industry participants. As these cells do not use any conventional fuels, they help in reducing economic dependence on oil producing countries, this in turn is likely to create high energy security for the user nations and also balance the trade deficit of emerging economies across the world. These factors are likely to stimulate the demand for automotive fuel cell market size over the forecast period. High initial cost associated with these products is likely to hamper the industry demand over the next seven years. Lack of product availability as well as need for technology advancements is also likely to negatively impact the industry. Transportation sector accounts for significant amount of carbon dioxide emissions which may cause GHG (green house gas emissions). Increasing fuel consumption results in high emission of harmful gases such as nitrogen oxides and hydrocarbons. For instance, as of 2015, transportation sector contributed one third of the total carbon dioxide emissions in U.S that could negatively impact the individual's health conditions. Light duty automotive fuel cell vehicle market size is likely to be estimated at over 7,500 units by 2023, growing at a CAGR of 12.4% from 2016 to 2023. Integration of fuel cells in this application may enable in cutting down gasoline consumption significantly. 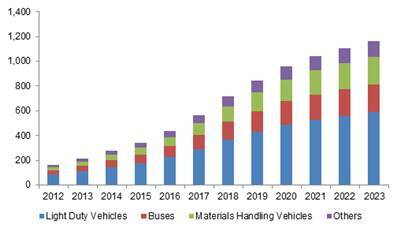 Materials handling vehicles sector is anticipated to be the most attractive segment, and is likely to grow at a CAGR of 14.5% over the next few years. These cells offer minimum operating cost and exhibit low maintenance as there are very less moving parts in the system. Hydrogen fuel is now greatly used in various applications such as buses, back-up power, small fleets of cars, forklifts, and is expected to be spread its significance to laptops and cell phones. In addition, attributes such as high stability while driving owing to low system vibration is predicted to boost the automotive fuel cell market size over the next seven years. Asia Pacific automotive fuel cell market size is anticipated to continue its dominance over the forecast period. It is projected to account for over 60% of the overall industry share by 2023 and is expected to grow at a CAGR of 11.8% from 2016 to 2023. Europe is forecast to be the most attractive regional segment; it is anticipated to grow at a CAGR of over 14.5% over the next seven years. The U.S. Department of Energy (DOE) awarded over USD 7 million in 2013 to promote fuel cell technology in order to commercialize the technology at the earliest. With continuous support from the DOE, national laboratories and private companies, the fuel cell market has progressed tremendously over the past few years in the country. Participants occupying major automotive fuel cell market share include Ballard, Fuel Cell Energy, and Toshiba. Other notable participants include Plug Power Inc., Panasonic, and Hydrogenics Corporation.